Okonomi Japanese Restaurant, located in Publika Solaris Dutamas is redefining what we use to think a sushi roll should look and taste like. 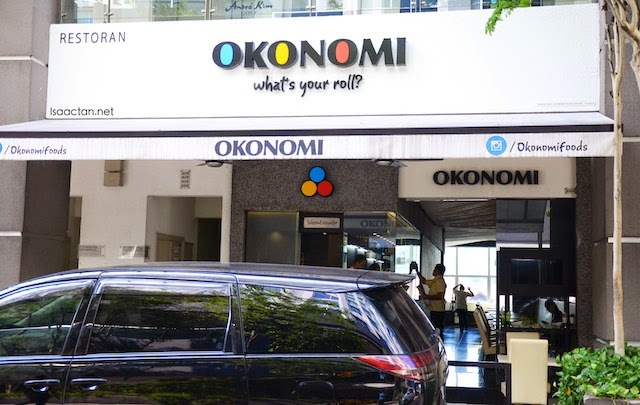 Coming from the word Okonomi which means "as you like it" in Japanese, we are encouraged to get creative in naming the ingredients we want inside our sushi rolls. Check out below on what they have to offer. No.1 Jalan Dutamas, Publika KL. Opening Hours: 10am - 11pm Daily. 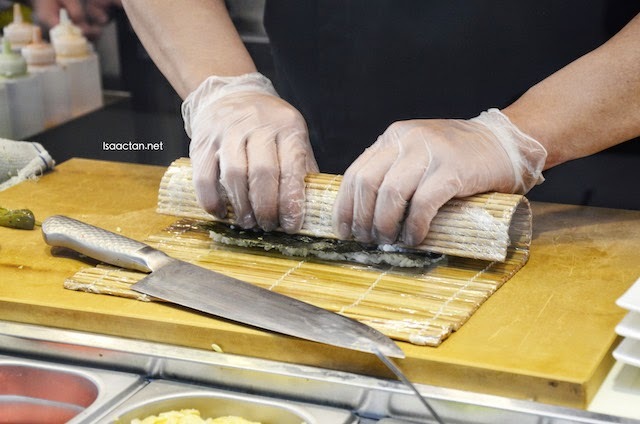 "We encourage you to indulge in your creativity to find a sushi roll that's just right for you using our unique ingredients such as fresh fruits, katsu chicken, soy wraps, and many more!" With various ingredients to choose from, ranging from crab, salmon, shrimp, ebiko, baby octopus, lobster, eel, to smoked duck, I was actually wondering if we could add in all these into one sushi roll. 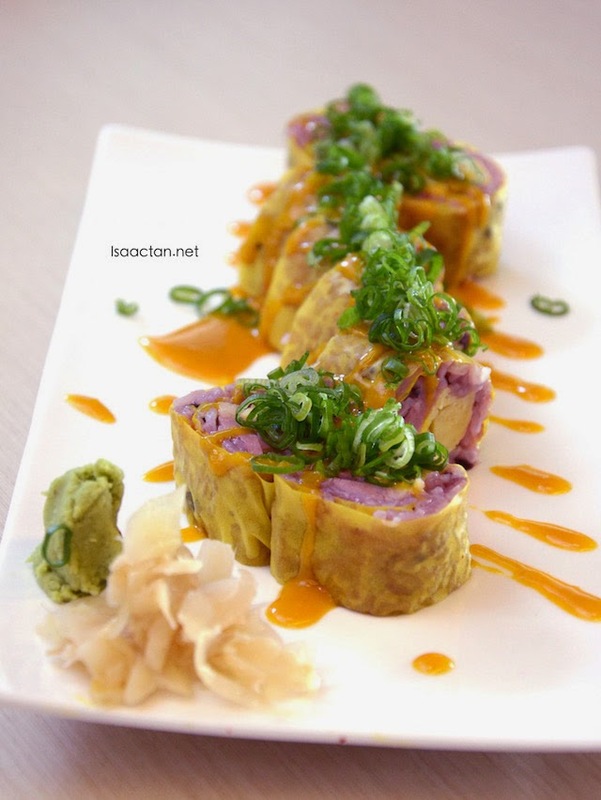 Of course, too much of a good thing isn't exactly recommended, hence we limited our selections to 3 or 4 ingredients per sushi roll. 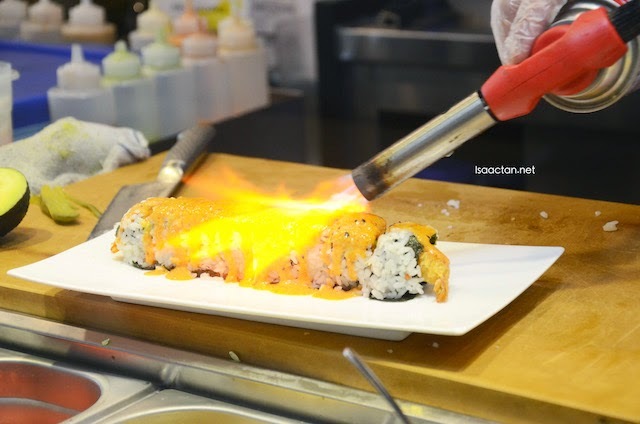 Okonomi's cuisine is prepared fresh and on the spot, where you could actually watch your sushi rolls get flamed, rolled and prepared. 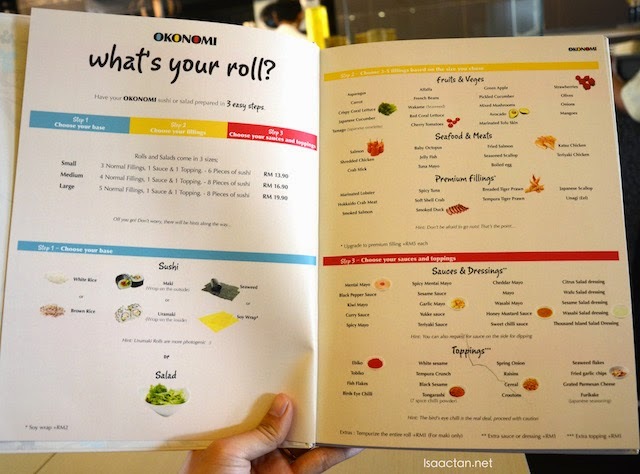 Ordering from Okonomi's menu is fairly simple, where you have a few steps to choose the base, toppings, ingredients, sauces and dressings. If you are like me however, and can't really make up my choices, then you can opt for their house rolls instead, created to please the sushi afficionado, first time sushi eater and everyone in between. That afternoon, I left my sushi roll creation in the hands of the chef. Prices start from RM13.90 for 3 normal fillings, 1 sauce & 1 topping to RM19.90 for 5 normal fillings, 1 Sauce & 1 topping. Each additional normal filling costs and extra RM2 each, while for premium filling such as lobster, crabmeat, smoked salmon, tiger prawn, scallop and smoked duck it costs an extra RM5 each. 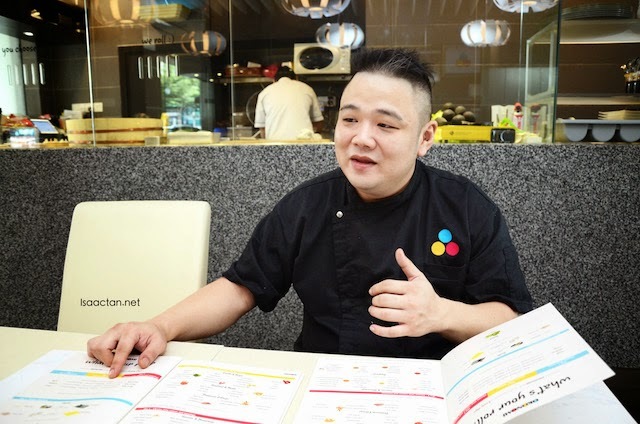 Everything can be seen from the picture of the menu above. 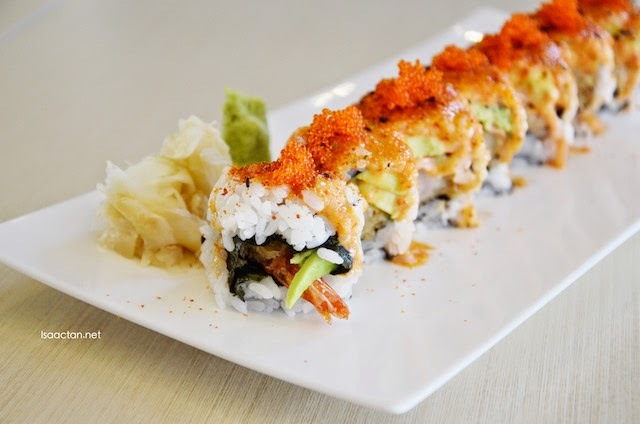 The first custom made sushi roll that arrived on the table was the chef's recommendation, one which is filled up with breaded tiger prawns, marinated lobster, uramaki, seaweed, avocado, spicy mentai mayo, tobiko and tongarashi. Most of their rolls came in servings of 8 bite sized pieces, ensuring you really get what you paid for. I did like this one due to the savoury taste of the premium filling, especially the lobster and tiger prawns which went well with the mentai mayo and tobiko. The next sushi roll we had was a completely different look and taste from the first one, where the chef recommended us to try their delectable soy wrap and very healthy brown rice. The premium filling used was the smoked duck, with maki, tamago, pickled cucumber, spring onion, doused with honey mustard sauce. It was my first time trying a soy wrap sushi, and I must say it did taste refreshingly different, in a good way. We got to try out some of their dishes from the ala carte menu as well, with the Crab Korokke coming out looking very tempting. 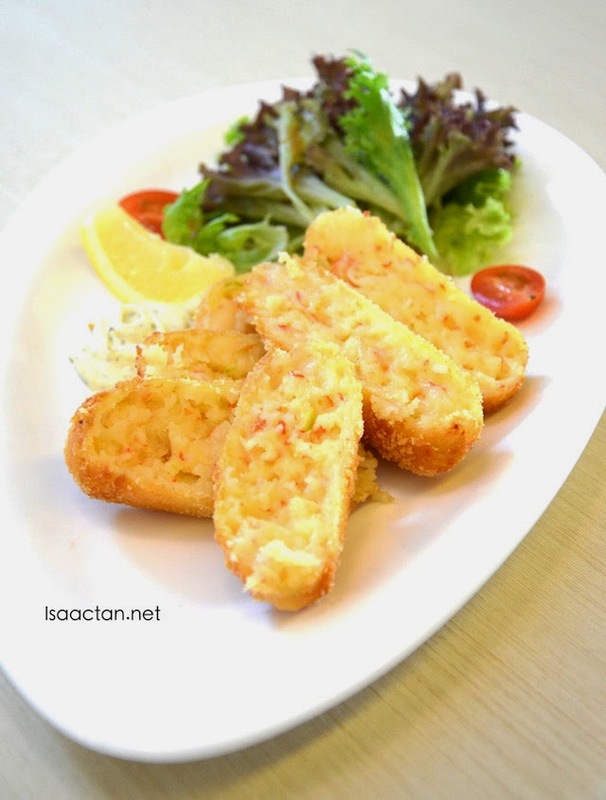 The gently breaded crabmeat is deep fried with poached butter and cream sauce, giving out that very savoury yummy taste. 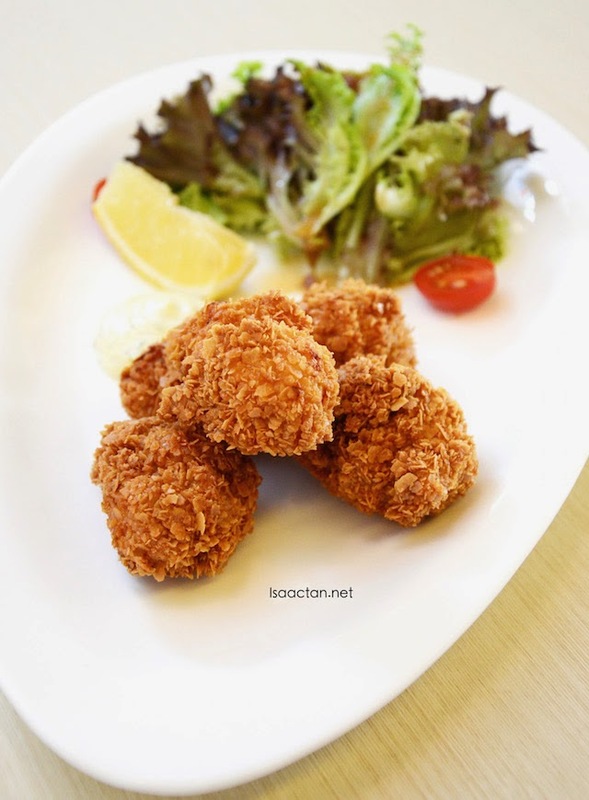 Always a fan of Chicken Karaage, I did not miss out the chance to savour Okonomi's version of this deep fried breaded chicken. Here, they actually caramelize it with some kimchi flavours, battered with cereal giving out that extra crunch. Not bad at all. 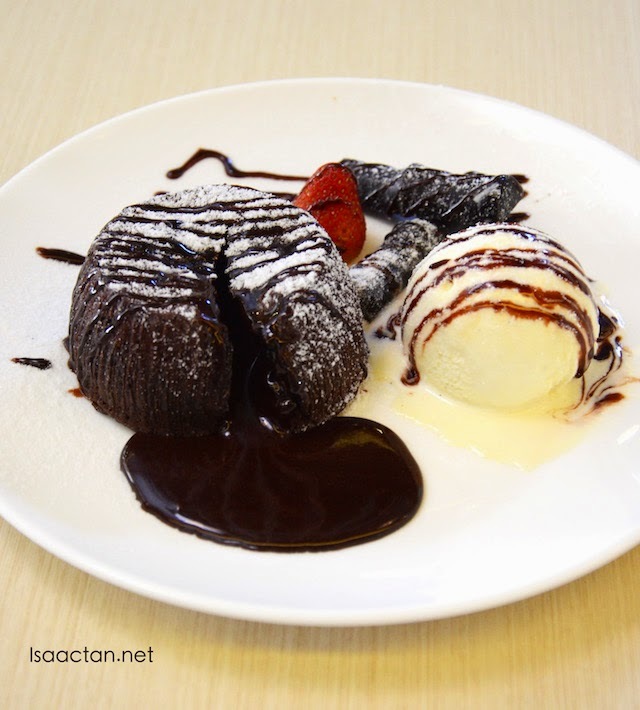 Ah, my favourite all time dessert would be the Chocolate Lava Cake, and here at Okonomi, they serve one of the best smooth flowing hot lava cake that I've had in a while. Absolutely love the way the chocolate molten lava center flows out the moment you cut into it. Topped with Belgian chocolate syrup, with vanilla ice cream, chocolate sticks and fresh strawberries coated with powdered sugar, try this out the next time you're here! Another dessert which looks almost too pretty to be eaten would be Okonomi's Macha Lovers Parfait. 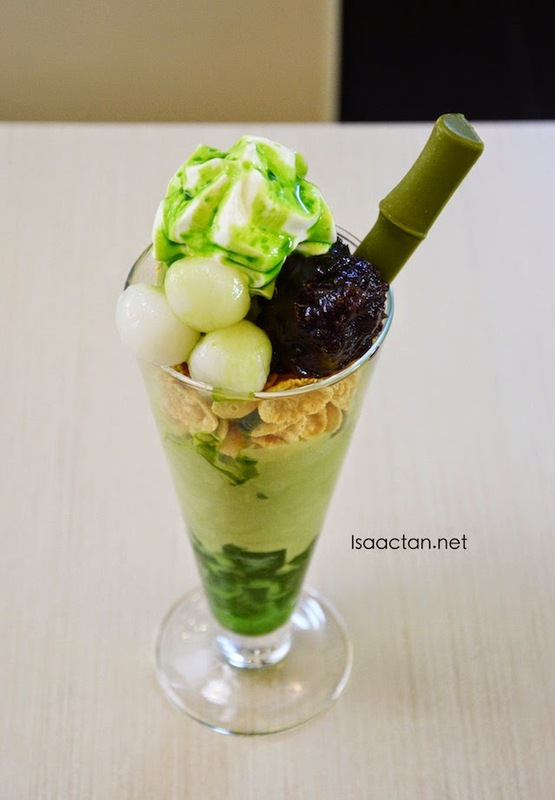 It was a twist of their Azuki Shiratama Parfait, made especially for matcha lovers with the addition of soft serve matcha ice cream and a matcha chocolate bamboo stick. The dessert itself was layered with kanten jelly and matcha syrup, corn flakes, garnished with red bean paste, rice mochi and whipped cream. Overall it was a really good meal out at Okonomi Japanese Restaurant, Publika Solaris Dutamas. 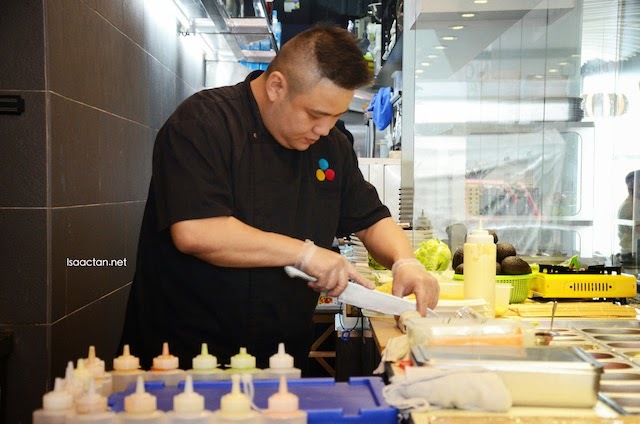 The ingredients used were fresh and very tasty, with a whole variety of sushi rolls to customize and choose from. Do try them out the next time you're in the vicinity of Publika Solaris Dutamas area. Wahhhhh!!!! Never trust a skinny chef! This one, sure best lah! Choc lava cake, already bonus marks! Nicely done!